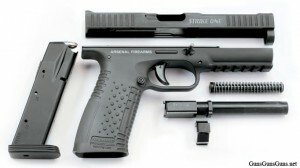 Summary: The description, specs, photos and user ratings for the Arsenal Firearms Strike One pistol. The Arsenal Firearms Strike One is a full-size, semiauto, striker-fired pistol chambered in 9mm, 9x21mm, .357 SIG or .40 SW. The Russian company says it will build it on either an alloy frame or a reinforced polymer frame. 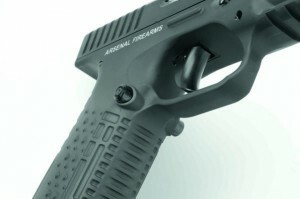 Arsenal says the trigger operates in the horizontal plain without raisers and therefore doesn’t feature the variable, long, rubbery trigger pull common to other pistols. Production is scheduled for September 2012. It will come with a dedicated security lock contoured foam case, two magazines, gun oil and a complete cleaning kit, the user’s manual and an international one-year warranty. 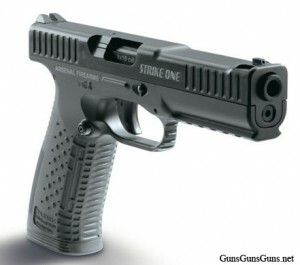 More reading: In 2015, The Firearm Blog published a good in-depth review of the Strike One. 9mm, 9x21mm, .357 SIG, .40 SW polymer 17+1 5″ 8.26″ 5.63″ 1.3″ 26.5 oz. 9mm, 9x21mm, .357 SIG, .40 SW alloy 17+1 5″ 8.26″ 5.63″ 1.3″ 31.4 oz. This entry was posted in .357 SIG, .40 SW, 9mm, 9x21mm, Arsenal Firearms, Full size, Semiauto on March 13, 2012 by Staff. Good Luck ….with finding one of these pistols. Seems as though distribution is annoyingly lacking ! I have tried for months to obtain one of these pistols with no luck ! Dealers seem to resist all attempts to sell these guns ! W H Y ?